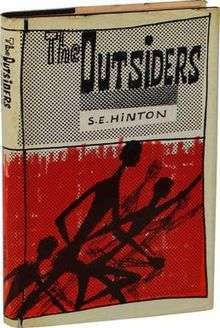 The Outsiders is a coming-of-age novel by S. E. Hinton, first published in 1967 by Viking Press. Hinton was 15 when she started writing the novel, but did most of the work when she was 16 and a junior in high school. Hinton was 18 when the book was published. The book follows two rival groups, the Greasers and the Socs (pronounced by the author as /soʊˈʃəz/, short for Socials), who are divided by their socioeconomic status. The story is told in first-person narrative by protagonist Ponyboy Curtis. The story in the book takes place in Tulsa, Oklahoma, in 1965, but this is never stated in the book. A film adaptation was produced in 1983, and a little-known short-lived television series appeared in 1990, picking up where the movie left off. A stage adaptation was written by Christopher Sergel and published in 1990. Ponyboy Curtis, a member of a gang called the “Greasers”, is leaving a movie theater when groups of “Socs” (short for "Socials", pronounced /ˈsoʊʃɪz/ soh-shiz), the Greasers’ rival gang, jump him. His two older brothers—Darry and Sodapop—and several members of their gang rescue him. The next night, Ponyboy and his Greaser friends Dallas "Dally" Winston and Johnny meet Socs, Cherry Valance and Marcia, at a drive-in movie theatre. Ponyboy realizes that Cherry is nothing like the Socs he has met before. Afterward, Two-Bit Matthews, another gang member, Ponyboy, and Johnny walk Cherry and Marcia home. Socs Bob Sheldon and Randy Adderson see them and think the boys are trying to pick up their girlfriends. Cherry prevents a fight and the girls leave with Bob and Randy willingly. When Ponyboy comes home at two in the morning, Darry becomes angry and in a fit of rage starts to yell at both Soda and Pony. Ponyboy runs away after Darry strikes him, and meets up with Johnny to run away. Ponyboy calms down and wonders if running away would be a good idea. The boys wander into a park in the neighborhood. Bob, Randy, and three other Socs confront them. After exchanges of derogatory remarks, Ponyboy spits at them. The Socs attempt to drown Ponyboy in a fountain. Johnny, anxious and terrified (and having been brutally jumped by Bob on a previous occasion) stabs Bob, accidentally causing his death. Ponyboy and Johnny, frightened and unaware of what to do because both know those who murder in Oklahoma will be executed on the electric chair, seek Dally’s help. Dally gives them money and a loaded gun and tells them to hide in an abandoned church in Windrixville. During their stay, Pony cuts and dyes his hair as a disguise and reads Gone with the Wind to Johnny. He also recites the poem "Nothing Gold Can Stay" by Robert Frost. Dally comes to check on them and he reveals that the tensions between the Greasers and Socs have increased since Bob's death. Johnny decides to turn himself in and Dally agrees to take the boys back home. As they attempt to leave, they notice the church has caught fire and several children are trapped inside. The boys run inside the burning church to save them, but Ponyboy is rendered unconscious by the fumes. At the hospital he discovers that he and Dally are not badly injured, but a piece of the church roof fell on Johnny and broke his back. Sodapop and Darry come to the hospital; Darry breaks down and cries. Ponyboy then realizes that Darry cares about him, and is only hard on Ponyboy because he wants him to have a good future. The following morning the newspapers declare Pony and Johnny heroes, but Johnny would be charged with manslaughter for Bob’s death. Two-Bit tells them that the consistent rivalry between the adversaries is to be settled in a rumble. Ponyboy and Two-bit run into Randy who tells them he will not participate in the fight. Later, they visit Johnny at the hospital when he is in critical condition. On their way home, Pony spots Cherry and they talk. Cherry says she is unwilling to visit Johnny in the hospital because he killed her boyfriend. Pony calls her a traitor, but after explaining herself, they come to good terms. After escaping the hospital, Dally shows up just in time for the rumble. The Greasers win the fight. Afterward, Pony and Dally hurry back to see Johnny. He dies while they are in the hospital and a maniacal Dally runs out of the room. Pony returns home that night feeling confused and disoriented. Dally calls the house to say that he has robbed a store and is running from the police. The Greasers find him, but see that Dally is pointing an unloaded gun at the police. They shoot Dally and he dies instantly. Ponyboy becomes overwhelmed and faints. He regains consciousness and is sick in bed for several days due to concussion. When the hearing finally approaches, the judge is generous and Pony is free from responsibility for Bob’s death. Pony will be allowed to remain at home with Darry and Soda. Ponyboy Curtis: Narrator and the youngest Curtis brother, 14 years old, who gets good grades and runs track. Sodapop Curtis: The middle Curtis brother, 16 years old, a high school dropout who works at a gas station. Darrel "Darry" Curtis: The oldest of the Curtis brothers, 20 years old, who has been caring for his brothers since their parents died in a car crash. Dallas "Dally" Winston: The roughest of the Greasers, who lived on the streets of New York City for three years. Keith "Two-Bit" Mathews: A wise-cracking kleptomaniac. Steve Randle: Sodapop's best friend since grade school. Johnny Cade: Ponyboy's best friend. He's 16 years old and lives with his alcoholic and abusive mother and father. Sherri "Cherry" Valance: Bob's girlfriend, attends the same high school as Ponyboy. Robert "Bob" Sheldon: Cherry's boyfriend who is stabbed and killed by Johnny. Randy Adderson: A friend of Bob's and Marcia's boyfriend. David: A member of Bob and Randy's gang who attempted to drown Ponyboy in the fountain. Paul: a former classmate of Darry's. Jerry Wood: The schoolteacher responsible for the children who were in the seemingly abandoned church. Mr. Syme: Ponyboy's English teacher who assigns him a theme to write. Marcia: Cherry's best friend and Randy's girlfriend. Paul Holden: A Soc who used to be friends with Darry. Tim Shepherd: Leader of another Greaser gang and a friend of Dally's. The Outsiders was a controversial book at the time of its publication; it is still currently challenged and debated. It was ranked #38 on the American Library Association’s Top 100 Most Frequently Challenged Books of 1990–1999. This book has been banned from some schools and libraries because of the portrayal of gang violence, underage smoking and drinking, strong language/slang, and family dysfunction. However, in many schools today, the book is part of the curriculum for middle and/or high school grades. ↑ Hinton, S. E. (2005) . "speaking with S. E. Hinton". The Outsiders. Speak/Penguin Putnam. p. 162. ISBN 0-14-038572-X. ↑ Hinton 1967, p. 180. ↑ "100 most frequently challenged books: 1990–1999 | American Library Association". Ala.org. Retrieved 2012-07-24. ↑ "Banned Books Awareness: The Outsiders | Banned Books Awareness". World.edu. 2011-05-08. Retrieved 2012-07-24. Hinton, S.E. (1997). The Outsiders. New York: SPEAK. ISBN 9780140385724.